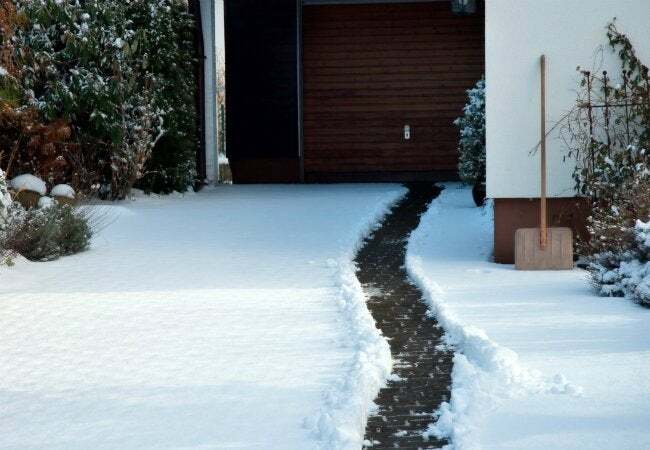 This winter, stop shoveling snow from the driveway at a glacial pace. Call a culinary companion to your rescue using this time-saving trick. Winter’s first snowfall is greeted with open arms for affording fun-filled activities like bobsledding, skiing, and building snowmen. But the persistent precipitation soon outstays its welcome, piling up on your entryway, car, and—most irksome—your driveway. To rid your hardscape of the fluff means embarking on the tedious, finger-numbing task of shoveling snow for hours on end. The kicker? The payoff of all that work lasts only until the next snowfall. Fortunately, you can spare time and your back by adding a dash of genius and a splash of cooking spray to your annual shoveling ritual. When Old Man Winter beckons you to leave the comfort of your warm bed to shovel the driveway before the day’s work, head to the shed to collect a plastic or metal snow shovel. Then, before pounding the pavement of the driveway, make a beeline for the kitchen to grab a can of non-stick cooking spray—any variety of oil will do. Generously coat both the front and back of the shovel blade with the cooking spray. Just as cooking spray acts as a lubricant and emulsifier that prevents food residue from adhering to pots and pans, so too does it work its magic on the shovel by keeping snow and ice from sticking to the blade. Rather than struggling to dislodge snow with each successive lift of the shovel, the oil allows you to slide the heftiest precipitation off the shovel blade quickly and easily. So stock up on a few extra cans at the supermarket before you have the chance to get snowed in, and you and your pristine driveway will be the envy of the neighborhood!